When you're making yogurt, whey is the yellowish-colored liquid that is drained off to give the finished product your desired consistency. Instead of discarding whey, try using it as a substitute for buttermilk or water in baked goods, as a nutrient-dense addition to smoothies or as the cooking liquid for oatmeal, rice, pasta, potatoes, quinoa or beans. Store whey in the refrigerator or in an airtight container in the freezer. According to Cultures for Health, a site dedicated to supplying information on homemade whole foods, the whey drained from yogurt preparation is defined as sweet whey. Sweet whey is virtually fat-free, with only 0.9 gram of total fat and 0.6 gram of saturated fat in each 1-cup serving. It is also low in cholesterol -- each cup contains 5 milligrams, an amount that fulfills about 1 percent of a healthy adult's recommended daily cholesterol limit of 300 milligrams. Each cup of yogurt whey contains 12.6 grams of total carbohydrates. All of these carbohydrates are contributed by simple sugars, with none from dietary fiber. Approximately 45 percent to 65 percent of your calories per day should come from carbohydrates. If you're on a 2,000-calorie diet, a 1-cup serving of whey would supply between 1 percent and 1.2 percent of this requirement. The primary sugar carbohydrate found in whey is lactose, since it's derived from dairy foods. If you are lactose-intolerant or are otherwise avoiding lactose, do not include whey derived from yogurt in your diet. Your body needs the B family of vitamins to aid in the metabolism of fats, carbohydrates and protein. They are also required for the synthesis of essential compounds and for the health of a number of organ systems. 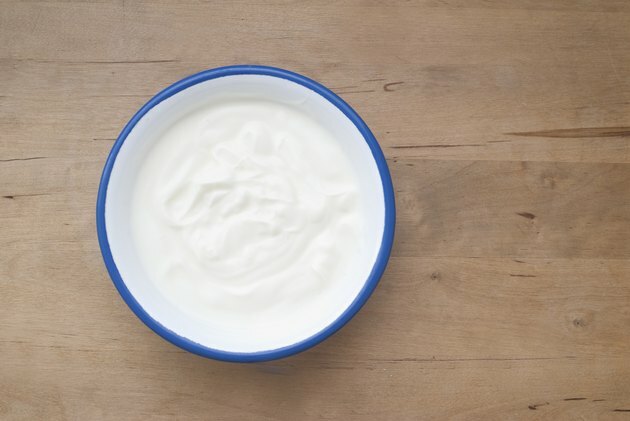 A 1-cup serving of yogurt whey contains about 0.4 milligram of riboflavin -- also known as vitamin B-2 -- or nearly 31 percent of the daily recommended allowance for men and 36 percent of a woman's requirement per day. Whey is rich in vitamin B-12, with each cup supplying 0.7 microgram of the nutrient. That's 29 percent of the RDA for the average adult. Healthy adult men and women between 19 and 50 years old should have at least 1,000 milligrams of calcium each day. With 116 milligrams of the mineral in each cup, yogurt whey contains over 11 percent of this recommendation. Women 51 years and older and men over 70 years old need 1,200 milligrams of calcium per day. Each cup of whey would supply approximately 10 percent of this requirement. Whey is also a good source of phosphorus -- each cup has 113 milligrams, or 16 percent of an adult's RDA.